Migraine has become a common problem nowadays. Due to the changed and stressful lifestyle, more no. of people is now suffering from the symptoms of migraine. There are several drugs in the market which can be used for the prevention or treatment of the migraine. In simple language, migraine is an episodic headache which can be either in one side or both sides of the brain. Sometimes in migraine, a person also suffers from the pulsatile attack of the headache. Generally, females suffer more from migraine as compared to males. In an average, out of every 4 migraine patients 3 are females. Other accompanying symptoms of migraine include photophobia, phonophobia, nausea vomiting. There are two types of migraine; classic migraine and common migraine. In classic migraine, there has a premonitory aura whereas common type of migraine doesn’t have an aura. There are several drugs present in the market which are used in the treatment of migraine attacks. I am here discussing the major classes of the drugs which are used for the same. NSAIDs are the drugs of choice for the treatment of mild to moderate migraine. NSAIDs act by inhibiting the prostaglandin synthesis and hence prevent the inflammation and increase the threshold for the pain. NSAIDs can’t be used or less effective in the severe migraine attacks. Major NSAIDs used in treatment of migraine include Aspirin, Acetaminophen, Naproxen, Ibuprofen and Ketorolac. 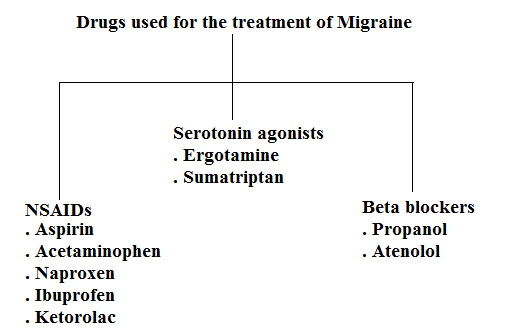 Serotonin agonists used in treatment of migraine include ergotamine and Sumatriptan. Ergotamine has high affinity but low selectivity to serotonin receptors. After biding to the Serotonin receptors, it brings out the vasoconstriction or venoconstriction which help in eliminating the headache of migraine. Ergot is not recommended in patients with coronary or peripheral vascular disease. Sumatriptan has high selectivity towards the D subtype of serotonin receptors. Sumatriptan is highly effective if administered through subcutaneously. This drug is not used for the prophylaxis of migraine. Sumatriptan should not be given to the patients suffering from Ischemic heart disease or hypertension. For stress related migraine, beta-adrenergic antagonists are the drugs of choice. Although, the mechanism of action of these drugs for preventing migraine is not clearly understood; but still they are used for the treatment of migraine. Propanol and Atenolol are two beta-adrenergic drugs used for the prevention of migraine. Note- Above information provided is just for the sake of information and a person must consult doctor if suffering from the migraine.